The village of Plantees, France, was Catholic in 1649. A farmer in the area, Pierre Port-Combet, had abandoned the Catholic Faith for the heresy known as Calvinism. He refused to allow his devout wife to raise their six children in the Catholic Faith – and instead, drew them into heresy. Pierre delighted in disobeying church directives by working on Sundays and feast days dedicated to Our Lady. It was on March 25, 1649, the Feast of the Annunciation, when a miraculous event occurred. Pierre decided to flaunt his disdain for the feast day by pretending to prune a willow tree with his knife alongside the road that others would be taking to Mass. He stabbed the trunk of the tree and then drew back in horror. The tree bled – so much so that it splashed on Pierre’s hands and arms. There was so much blood that for a moment he thought that maybe he was wounded. Puzzled, he stabbed the tree again, and it bled even more. At this moment, his wife was passing by on her way to church – and hurried to see if he had any wounds, but could find no injury. After hearing his story, the wife took the knife and stabbed the tree, but nothing happened. Frustrated, Pierre took the knife from her and stabbed the tree again. Once again, the tree spurted blood. The altar with a piece of the willow tree preserved within. A neighbor, Louis Caillet, was passing by and tried to produce the same effect, but nothing happened. Other neighbors passing by tried to make the tree bleed with repeated attempts, but nothing would happen. Only when Pierre struck the tree, would it bleed. The crowd that had gathered all agreed that the miracle only took place at the hand of the heretic, and that the prodigy was a stern warning for Pierre to convert and observe the laws of the Church. The bishop ordered an inquiry, and a tribunal of churchmen finally declared that Pierre had indeed received a severe warning from Heaven. Pierre began profound prayers at the willow tree, but disapproving Calvinists threatened him with bodily harm. His actual conversion was thereby stalled for the next seven years. Overwhelmed with remorse, Pierre ran after Our Lady as she began moving away. But then he saw her suspended several feet in the air and slowly fading from sight. He realized that he had been granted a vision of the Blessed Virgin and fell to his knees, sobbing uncontrollably, and pledged a complete reform. One month later, on the eve of the Assumption, Pierre contracted a serious illness. A priest of Vinay heard his confession and welcomed him back into the Church. He completed his conversion by receiving the Holy Eucharist the next day on the Feast of the Assumption. His conversion inspired many others to also convert – including his son and five daughters, as well as many Protestants and Calvinists. Our Lady’s words, “Realize that your end is at hand,” were confirmed with his death just weeks later. In accordance with his final wish, he was buried at the bottom of the willow tree. The Propagation of the Faith in Grenoble gave its approval for the purchase of the field of the apparition and to build a chapel there. 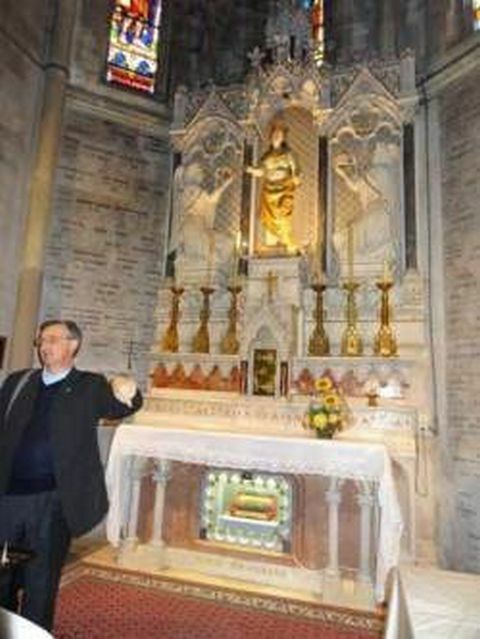 Unfortunately, during the French Revolution, terrorists pillaged and desecrated the sanctuary and hacked to pieces a statue of Our Lady that had been sculpted according to Pierre’s description. Luckily, a valiant woman hid the pieces until peace was restored. Following the Revolution, devotion to Our Lady of the Willow was restored by the Oblates of Mary Immaculate. In 1856, Pope Pius IX decreed a solemn jubilee and a papal crowning of the restored statue. Another crowning was ordered by the same pope in 1873. The church was raised to the dignity of a small basilica by Pope Pius XI on March 17, 1924. The once-mutilated statue of Our Lady is found here. Beneath her altar is a decorative box containing the piece of the willow tree. Pierre’s tomb is at the foot of this altar. Prayers said before this altar have led to more than one hundred miraculous cures. These miraculous healings are said to be “undoubtedly genuine” due to the sworn testimonies of reliable witnesses.